Director Shankar is a man of high caliber and we know that seeing all his movies in the past being secretly kept under the wraps (till the point of release, in some cases). The latest is that news from the unit of 'Endhiran' is making waves in the filmdom. 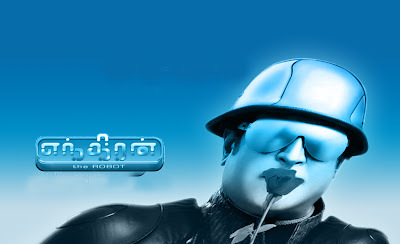 Apparently Rajini plays both the villain and hero in 'Endhiran'. Therefore to differentiate in voices of the protagonist and antagonist, he has modulated his voice according to the character. That means the audience will get to hear two different voices of Rajini! Wow! There also another villain in the movie, supposedly a wicked character played by Hindi actor Danny Denzongpa. Not just that news, also circling in the film circles is that Aishwarya Rai will have more than 50 new looks in the movie with the make-up department headed by Bhanu, who took care of the make-up even in 'Sivaji'. Also it is learn that, dance master Dinesh has choreographed a fast paced song set to tunes by A R Rahman, where Rajini and Ash have danced amazingly. Well apart from all this, words from a section of media say that a laboratory set of Rajini (we all know he's a scientist in the movie) was set up at a cost of Rs.5 Crores. The set is apparently designed by ace art director Sabu Cyril. We can't really call them gossips, the climax has been leaked but nothing has been confirmed on that front. One of them is that Amitabh Bachchan is playing a cameo! 'Endhiran' is all set to release in August, with the promotions of the movie being launched in July. Time will answer all our answers, as it is the terrific combination of Rajini –Shankar- A R Rahman that is coming together again!